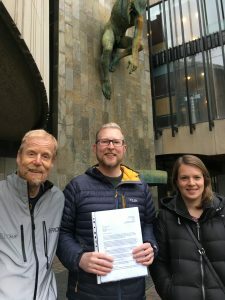 SPACE for Jesmond have submitted a petition to Newcastle City Council signed by over 180 people who support the currently-shelved closure of Haldane Road bridge, which was to make the streets safer for local residents and those walking and cycling through the area. The bridge, situated in South Jesmond ward and linking Osborne Road to existing cycling and walking routes, was to be closed to motor traffic in order form a key cycling route through Jesmond. The area is the location for two large private schools and a route to West Jesmond Primary. The narrow bridge is heavily used as a rat-run for drivers wishing to avoid traffic lights and vehicles regularly mount the pavement while congestion is caused due to high levels of school run traffic heading in opposite directions. It is also a key route for those cycling into the city and those who walk to the schools. As previously reported in the Chronicle, the council engineers’ closure plan, part of a £1 million programme of improvement in Jesmond, has been shelved by local councillors who are reluctant to impact on residents in the area, fearing a shift in motor traffic to adjacent streets. Our petition shows that there is actually a strong level of support from residents in the immediate vicinity to close this bridge to motor traffic; over 50 signatures were received from residents living close to the bridge during our door-knocking campaign. SPACE for Jesmond’s position is that the council should not renege on their their commitments to increase cycling and make residential streets safer. The council have bid for and received a substantial pot of funding from central government on the basis that they will support people to travel sustainably and make streets safer and more pleasant. It makes little sense to on the one hand commit to reduce car dependency and on the other to say that those commitments will not be put into action because they must facilitate drivers. We completely agree. They key here is to reduce the traffic in the area by directly addressing the real issue – large numbers of children being driven to and from the school gates – and providing safe walking and cycling routes are a key part of making that reduction. SPACE for Jesmond is an informal group of Jesmond residents trying to make our home a better, safer place for those who want a liveable neighbourhood and wish to travel sustainably on foot or by bicycle. Many of us have been part of the local reference group for “Streets for People” which is part of the UK Government’s “Cycle City Ambition” programme of funding. This reference group has been active for three years, and we have given many hours of our time to help shape the £1 million investment being made in Jesmond to enable walking and cycling. The rationale behind this programme of investment is quite clear; as a society we must change the way we travel in order to reduce congestion, reduce inactivity, improve air quality and tackle climate change. Action must be taken at a local authority and ward level to effect this change – because local changes lead to national and global ones. The engagement officer emailed us on the 17th January 2019 with an update regarding Streets for People. In it, the shortlisted scheme list has been changed with several impactful designs completely removed and other schemes – previously ruled out by officers – replacing them on the list. A) This decision to re-prioritise schemes has been made behind closed doors and has not involved the reference group, which it was supposed to. We find this change to decision making – and lack of transparency – extremely concerning and not in keeping with the process specified by council officers, who assured us on numerous occasions that this would not happen and that this was going to be an exemplary bottom-up participatory exercise. B) The schemes that would contribute most to cycling and walking have been removed. A decision has been made to drop the proposed extension of Strategic Route 4 on Eslington Terrace onto Osborne road (via a modal filter on Haldane bridge). This was identified as being a key East-West route for cycling in the city during the process of developing the plans, enabling journeys into town and to Heaton and High Heaton. A decision also appears to have been made to drop improvements to Tankerville Terrace which would increase safety outside the schools and improve the streets cyclability. This is the second time that plans have been drawn up and community engagement conducted in relation to Tankerville Terrace and this is the second time that plans have been dropped without explanation. The de-prioritisation of these schemes is therefore not in line with the proposals submitted to the Department for Transport. They suggest that the council are anything but ambitious and do not intend to honour their original commitment to improving cycling provision in Jesmond. C) This change does not appear to make full use of the £1 million assigned to Jesmond. A promise was made to all three Streets for People areas that they would receive roughly (as close as possible) similar funding. The schemes proposed in November 2018 included cycle lanes on Osborne Road and Tankerville Terrace and were costed at a little over £1 million. These have not been replaced with schemes of equivalent value. We have been informed that the proposed schemes will only cost just over £500,000. Where is the rest of the funding? We request that the minutes of the meeting where this shortlist was changed are made public. Who has decided to cancel schemes which would support cycling? On what basis did they cancel those schemes? How can these changes be justified in light of the council’s own targets as set out in the funding application for Cycle City Ambition? We believe that it is not in the public interest to withhold schemes on which a great deal of time and money has been spent. It is difficult to understand why councillors were happy for these schemes to be progressed to this point if they do not intend to follow through with them. Local councillors may feel that they have the best interests of residents at heart, however they are denying residents the opportunity to judge the plans for themselves. We do not believe that the council’s of aim of 12% cycling mode share for journeys under 5 miles can possibly be met when the council itself is sabotaging that goal. It is time that the council stood by its commitments and delivered the changes needed to make Newcastle fit for cycling. The area around West Jesmond Primary School is very busy with traffic from the three schools on Tankerville terrace, which SPACEforJesmond believe should be a priority for our community to address. High levels of traffic around the schools – some from within Jesmond and as little as 300 metres away – create an unsafe and polluted environment for our children. 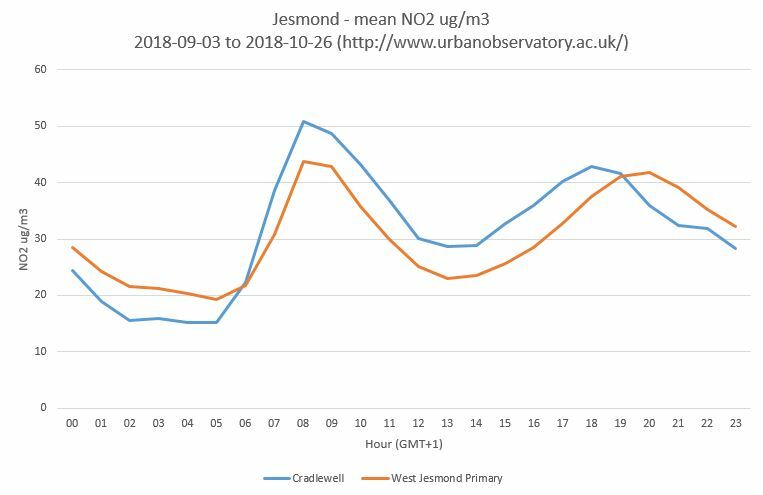 In order to quantify pollution levels, last winter SPACEforJesmond used a portable air quality monitor to sample the air around Jesmond, primarily on the school run and around West Jesmond Primary school. This revealed “hotspots” of pollution in areas where it might be expected, such as Osborne Road and Tankerville Terrace. The portable air quality monitor measured particulate matter (PM) of various sizes, all of which have a detrimental effect on our health. The monitor did not however measure Nitrogen Dioxide (NO2) which is the focus of much attention at the moment due its harmful effects, especially on children, who are still developing physically. NO2, a bi-product of diesel combustion, has an impact on respiratory health and development and has been indicated as a cause of obesity in children. 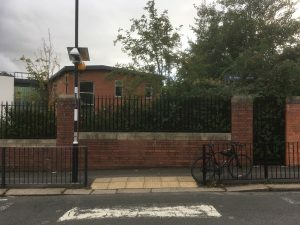 Thanks to the Urban Observatory, a lamp-post mounted air quality monitor was installed outside West Jesmond Primary School for the start of the new school year. This sensor measures, amongst other things, Nitrogen Dioxide (not to be confused with Nitrous Oxide, a.k.a. laughing gas). The results from the first school term highlight the impact of the morning school run. The peak value on a weekday occurs between 8am-9am, when the level of pollution doubles (44ug/m3) compared to the background levels in the middle of the night. The levels rise less dramatically for the afternoon run, presumably due to the mix of after-school clubs and different approaches to picking children up at the end of the day. What’s really interesting to note is that, on weekdays, the area around West Jesmond Primary is almost as polluted as the A1058 Coast Road. The daily mean value for the Coast Road NO2 during this period was 31.5ug/m3 (measured at the Cradlewell Urban Observatory high precision air monitor). The value for the sensor at WJPS was 30.2ug/m3. So, what does this mean? It’s important to note that there is nothing illegal about these levels of pollution – the monitor outside WJPS is not a legally designated site, and the annual mean limit set by the EU is 40ug/m3. After a year’s worth of monitoring, it will be possible to compare these levels against the legal limits. Despite this, the data indicates that the morning rush around Tankerville Terrace effectively doubles the pollution levels and that for the first school term, weekday pollution here was similar to the A1058 at Cradlewell, which is the location of a DEFRA network station, the measurements of which are close to breaking the legal annual limit on NO2, and have done in previous years. Diesel combustion is also temperature sensitive and many of the pollution removing features are turned off in cold weather and this is true whether the vehicle is moving or idling. It is common to see people idling for periods of time outside the school – likely to keep the heater working – and this produces pollution too. A colder spell could really increase pollution in the area and SPACEforJesmond will continue to monitor this site. In our view it’s vital that councillors and council officers take action to protect children on the school run by reducing polluting traffic and enabling walking and cycling to school. Children who are driven, some from very close by, are receiving a double-dose of negative health impacts through inactivity and exposure to pollutants. This is being already addressed in schemes elsewhere in the UK – such as Hackney School Streets and Edinburgh School Streets – and Newcastle should follow their lead, as a UNICEF child friendly city, to do what is right for children in Jesmond. Campaigning by a Councillor? It can happen! In Newcastle, it is unusual for governing party councillors to speak out loudly on a topic not approved by the council. There seems to be a fear that if some residents don’t approve, it is better to take action behind the scenes. So I was pleased that a Labour councillor in St Andrews – where I have started a vibrant cycle campaign – went to the press to fly a balloon in favour of pedestrianisation – which is not (as yet) supported by the Council. An expensive re-make made the central street, Market St, one way in 2010 with widened pavements and old style cobbles, but no cycle contraflow and lots of idling and offensive exhaust fumes. Pedestrianisation was considered at that time but was heavily opposed by the Merchants’ Association for the usual reasons. 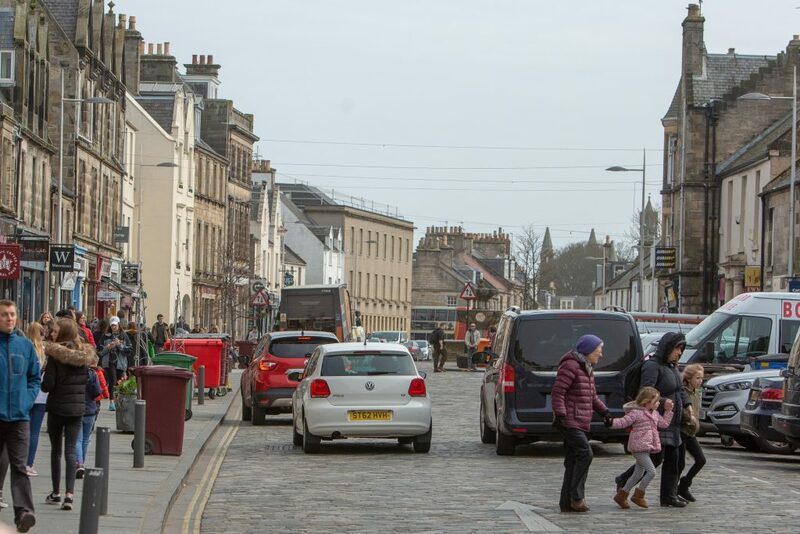 St Andrews Space for Cycling (SASC) would like to make the whole central area car free and to soften people up, we are pressing for a car free day in the autumn. Our member and councillor Brian decided there is enough support for a change and put out a press release (without council discussion) calling for pedestrianisation and asking residents to write to him with their views. This was put on the front page of the Courier (regional paper) and Citizen (local paper) and was the subject of a feature article in the latter. And the feedback? Lots of criticism on Facebook, but the messages received by the Councillor were 80% in favour. .. and now, there is a momentum. Local students have offered to lead a feasibility study and Cycling Scotland will help. The council can hardly hold back if there is pressure from the public for walking and cycling spaces. Could this happen in Newcastle? Let’s ask the new councillors after the election: for a start, a traffic free school run to West Jesmond School! There are elections for the Council happening in Newcastle on the 3rdMay 2018. This year new ward boundaries are being introduced, and Jesmond residents have three votes to elect candidates in their ward. Please keep checking back in advance of the elections on 3 May and if one of your candidates has not yet answered please do encourage them to do so. The very least we should expect from future local councillors is a willingness to engage with local residents and share their vision for the future of Jesmond. Everyone should be able to travel safely whether they walk, cycle, use public transport or drive and should feel safe while they do so, but this isn’t currently the case in Jesmond. Often, traffic is fast and it isn’t always easy to see due to the high level of kerbside parking and high sided vehicles. Children are less able to look out for themselves and are more likely to be injured or even killed in the event of a collision, so focusing on children, whether travelling independently or with an adult, is a good way to make Jesmond safer for everyone. 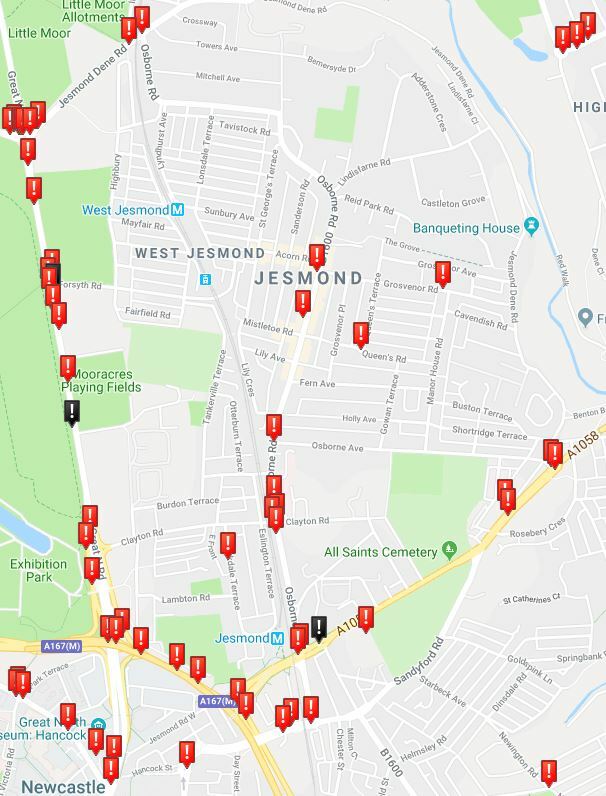 While it is right that children are the priority, the map below shows the locations of where people have been killed or seriously injured in the Jesmond area in the last 10 years (2008-2017). As with other UK cities including Liverpool and Edinburgh we hope Newcastle will also adopt a “Vision Zero” target i.e. zero deaths or serious injuries on Newcastle’s roads. Some streets in Jesmond are suitable for children to play out but many are not. Jesmond is permeable to motor traffic wishing to avoid the Coast Road (A1058 Jesmond Road) and since the closure of Jesmond Dene Road rat-running occurs through residential streets. Similarly, Osborne Road – a residential street – is used as a “relief valve” for traffic on the Great North Road, despite electoral candidates for Jesmond agreeing in 2014 that Osborne Road should be for access only. Making streets safer and cutting air pollution should be objectives that everyone supports, but it is still important that the council and local councillors engage with the community to ensure that residents understand what the issues are and have a chance to help solve those issues. Air pollution in particular is invisible and we’ve found that many people haven’t been aware that it has been, and continues to be, a problem in Jesmond. Nor are people generally aware of the very serious health impact of sedentary lifestyles which cost taxpayers billions of pounds every year and are responsible for even more early deaths than air pollution. Likewise it is often challenging to put ourselves in others’ shoes, to understand for example what it is like to be a child on Jesmond’s streets, what it is like to be a parent cycling or walking with children (or even alone) on busy streets during the rush hour, or what it is like for residents or visitors with disabilities or conditions for whom travel is a challenge. It is only by having this broad engagement that we can ensure that Jesmond’s streets are safe and accessible for everyone. These five pledges are based on SPACE for Jesmond’s objectives* which you can see on our home page. We welcome input from candidates about how they will go about meeting other aspects of those objectives to make streets in Jesmond more healthy, liveable, accessible and safe for everyone of all ages and abilities. *Please note that at the time of writing our objectives are temporary and may be further refined to reflect Jesmond’s specific needs. In an open letter to UK Transport Ministers, a group of health and transport specialists have urged Ministers to ditch a “windscreen perspective” and reverse a 42-year decline in children’s mobility. Highlighting increased car use on the school run – almost half of primary pupils are now driven – the authors suggest 10% of national infrastructure budgets be put toward better routes for walking and cycling, because the “default choice” of car travel is damaging children’s health, not just through inactivity, but also because air pollution becomes concentrated inside vehicles. Of course, it isn’t just a matter of children’s independence and health. The authors highlight the wider benefits to physical and mental health, the public purse and improvements in air quality and travel time that would result from a sensible level of investment in active travel. With Transport Scotland doubling their investment in active travel, it would be great to think that the rest of the UK will follow suit, especially considering the myriad benefits which come from reduced reliance on motor cars. However, while we puzzle over the lack of investment from Westminster, we need to consider; what can be done right here and now in Jesmond? After all, we don’t want our kids to end up like Alex. Too much traffic, so we drive! 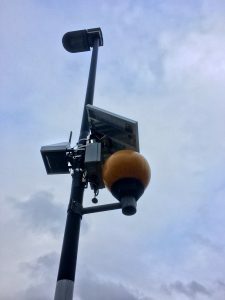 To try and quantify pollution in Jesmond, SPACEforJesmond have taken the opportunity to work with Sense My Street, a project run by Aare Puussaar at Newcastle University’s Open Lab. 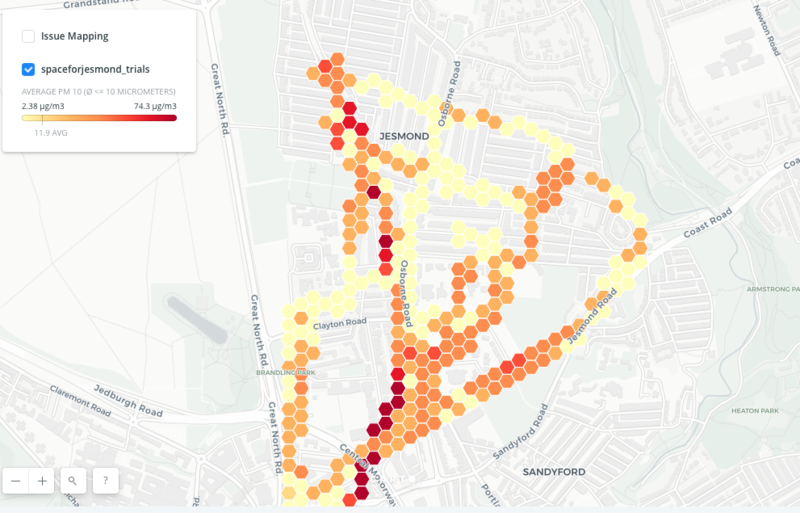 I spent December 2017 walking around Jesmond with a Fidas Frog portable Air Quality monitor and a GPS tracker, to find out what the Air Quality is like in Jesmond, and importantly, how this changes in particular streets, especially at busy times. An area of focus was West Jesmond Primary School on Tankerville Terrace, around school run time. Tankerville Terrace is often very busy and at some times, a complete standstill. There are often idling vehicles which become backed up along the length of the street. While Petrol and Diesel vehicles produce pollutants of varying types, the Frog measures particulate matter (PM) – very fine dust which is emitted as a by-product of diesel combustion among other things. The results are now available, and very interesting. Note: The colour gradient does not indicate anything dangerous or illegal about the measurement. The World Health Organisation do not have a “safe limit” for PM exposure and EU legal levels are not measured using the method employed here. To get a fuller picture of PM levels in Jesmond would require more intensive monitoring, but as an indicator of the exposure I have as a commuter on the school run, it seems that the further away from the traffic I am, the lower my exposure – which is exactly what we would expect. So, to lower my exposure, I can try and avoid the main roads. However, two of the “hotspots” are around schools, and there’s no way that children can avoid these areas. The only way to improve the air quality is to reduce the amount of motor traffic near the school, and to do that, we need to shift more journeys to walking, scooting, cycling and public transport.